Scheduling a tournament can be a very tedious and time-consuming process. Tournamatic.com makes this process extremely easy. I will show you how here. You have created your tournament on Tournamatic.com. All the participants have signed up. Registration deadline has arrived and there will be no more participant entering the tournament. To make sure that our assumptions are correct, we need to first log in to Tournamatic.com. You will be redirected to your Dashboard page after you successfully log in. To ensure all the participants have signed up as we expect, let’s navigate to participants details page by pressing the participants icon. After reviewing the participants in all the divisions and making sure that nobody is left behind, move back to Dashboard and this time press Schedule icon. 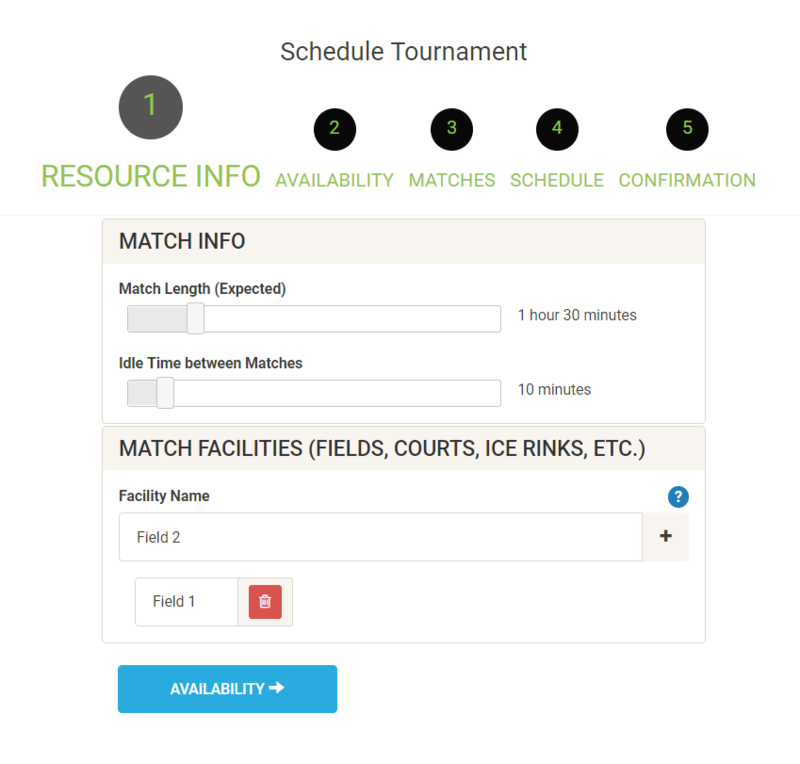 The first stage in scheduling your tournament is entering the basic match information, including estimated length of a match, idle time between matches and a list of all the facilities that are available for playing the games. A facility in soccer for example is a field (like Field 1). In hockey is Ice or Rink (like Ice 1). 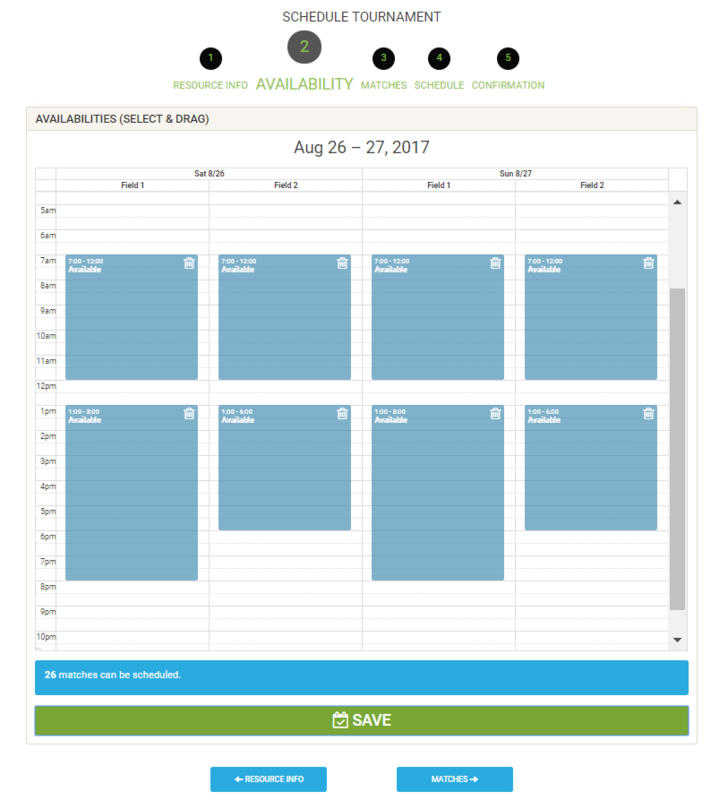 After you enter the details of resources, It’s time to specify the availability of each facility in any of the days. As depicted in the screenshot below, this is as easy as selecting and dragging the boxes that represent the available times. Press save when you have completed selecting the available times. After clicking save, a message will display the total number of matches that can be scheduled for your tournament. 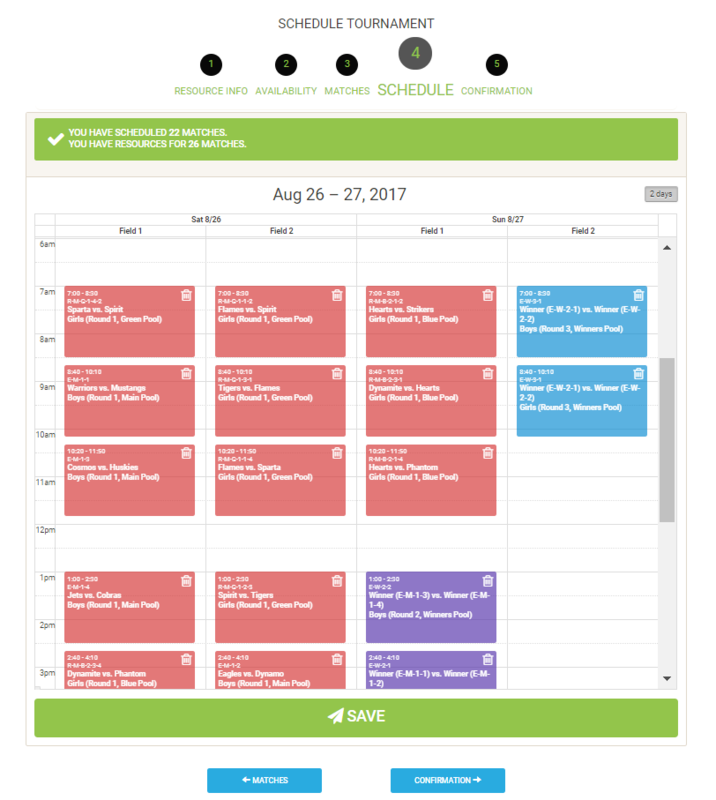 At this point, we have all the information about the resources and their times available for scheduling. Now, it is time to specify the competition format for each division. A tournament is comprised of several rounds. In each round, you can specify the format that you believe is going to fit your resources the best. Tournamatic.com will warn you if you go over the capacity. 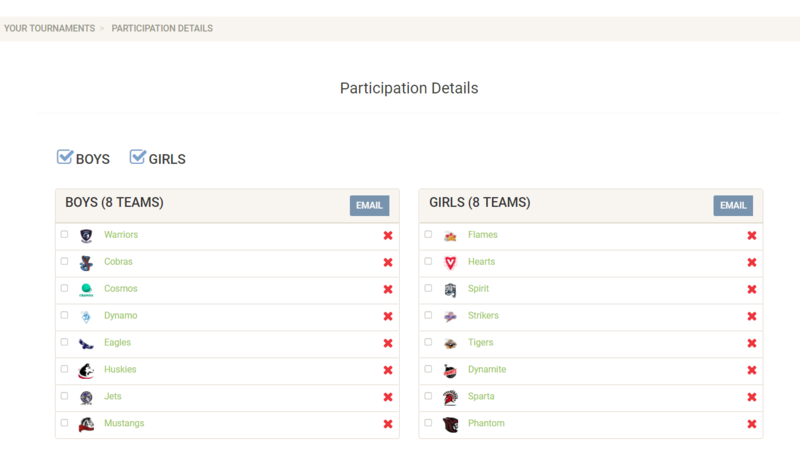 In the following picture, there are two divisions (Girls and Boys). First round for Boys division as you can see is an elimination round and for Girls division, there are two pools of round-robin matches. Note: Each division has a button on top that displays a preview of the generated bracket of all the matches. When you are satisfied with the formatting of the competition, it is time to generate the schedule. 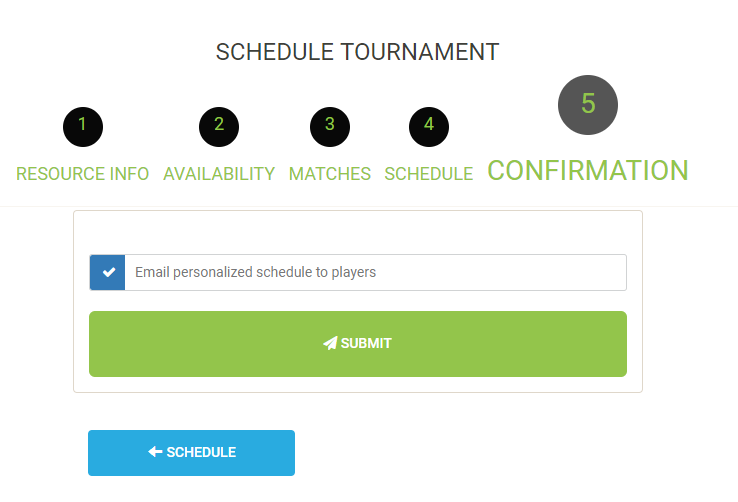 After you save your changes and navigate to next step (Schedule), tournamatic.com generates your tournament’s schedule. If you want to change time and facility of a match, you can easily drag that match and drop it in the desired time slot in the calendar and press Save again. Finally, when you feel satisfied with the schedule, you can navigate to the final step. 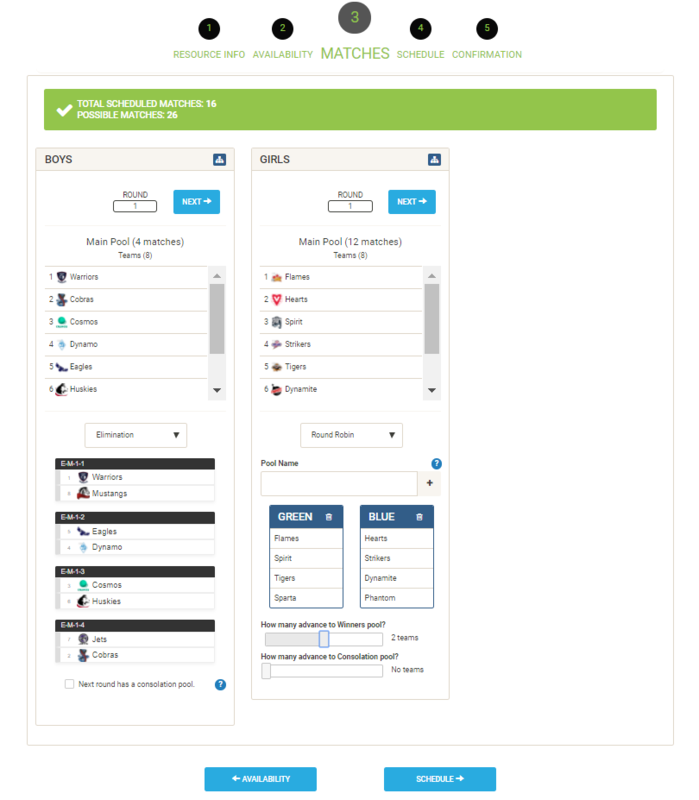 In this final step, you can chose to notify all the players in all the participating teams with their personalized team schedule (only first round matches). Note: We can only send notifications to the players that we have their emails in the system. Regardless of sending email notifications or not, the tournament schedule will be publicly available on your tournament page after you submit it. After submitting the schedule, if for some reason you decide that you need to change times or facilities, you can delete the schedule (from your Dashboard page) and re-schedule your tournament.